For earlier cruisers operated by the Imperial Navy, see SMS Königsberg. 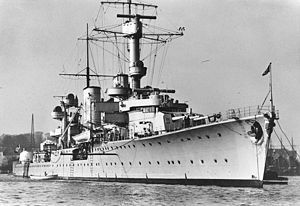 Königsberg was a German light cruiser that was operated between 1929 and April 1940, including service in World War II. She was the lead vessel of her class and was operated by two German navies, the Reichsmarine and the Kriegsmarine. She had two sister ships, Karlsruhe and Köln. Königsberg was built by the Kriegsmarinewerft in Wilhelmshaven; she was laid down in April 1926, launched in March 1927, and commissioned into the Reichsmarine in April 1929. 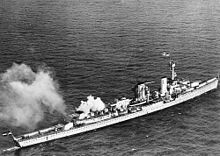 She was armed with a main battery of nine 15 cm SK C/25 guns in three triple turrets and had a top speed of 32 knots (59 km/h; 37 mph). Königsberg served as a training ship for naval cadets throughout the 1930s, and joined the non-intervention patrols during the Spanish Civil War in the late 1930s. After the outbreak of World War II in September 1939, she laid defensive minefields in the North Sea and then participated in Operation Weserübung, the invasion of Norway in April 1940. While attacking Bergen, she was badly damaged by Norwegian coastal artillery, and sunk by British bombers the following day in the harbor. The wreck was eventually raised in 1942 and broken up for scrap the following year. Königsberg was 174 meters (571 ft) long overall and had a beam of 15.2 m (50 ft) and a maximum draft of 6.28 m (20.6 ft). She displaced 7,700 long tons (7,800 t) at full combat load. Her propulsion system consisted of four steam turbines and a pair of 10-cylinder four-stroke diesel engines. Steam for the turbines was provided by six Marine-type double-ended oil-fired boilers. The ship's propulsion system provided a top speed of 32 knots (59 km/h; 37 mph) and a range of approximately 5,700 nautical miles (10,600 km; 6,600 mi) at 19 knots (35 km/h; 22 mph). Königsberg had a crew of 21 officers and 493 enlisted men. The ship was armed with nine 15 cm SK C/25 guns mounted in three triple gun turrets. One was located forward, and two were placed in a superfiring pair aft. The rear gun turrets were offset to increase their arc of fire. They were supplied with 1,080 rounds of ammunition, for 120 shells per gun. The ship was also equipped with two 8.8 cm SK L/45 anti-aircraft guns in single mounts; they had 400 rounds of ammunition each. Königsberg also carried four triple torpedo tube mounts located amidships; they were supplied with twenty-four 50 cm (20 in) torpedoes. She was also capable of carrying 120 naval mines. The ship was protected by an armored deck that was 40 mm (1.6 in) thick amidships and an armored belt that was 50 mm (2.0 in) thick. The conning tower had 100 mm (3.9 in) thick sides. Königsberg was ordered as "Cruiser B" and given the temporary name Ersatz Thetis, since she was intended to replace the old cruiser Thetis. She was laid down at the Kriegsmarinewerft in Wilhelmshaven on 12 April 1926 and launched on 26 March 1927. She was commissioned into the Reichsmarine on 17 April 1929. After her commissioning, the ship was assigned as the flagship of the reconnaissance force for the German fleet. She thereafter conducted a series of training cruises for naval cadets and made numerous goodwill visits throughout the Mediterranean Sea. In 1931, the ship's first major modification took place; her foremast was shortened and her rear superstructure was slightly lengthened. Otto von Schrader commanded the ship from September 1931 to September 1934. Hubert Schmundt relieved him and served as the ship's captain for the following year. In 1934, a pair of 8.8 cm (3.5 in) anti-aircraft guns in individual mounts were installed on her aft superstructure just forward of her main battery turrets. That same year, she and the cruiser Leipzig made the first goodwill visit to the United Kingdom since the end of World War I sixteen years earlier. In 1935, the ship had an aircraft catapult installed, along with a crane to handle floatplanes. The following year, the single 8.8 cm guns were replaced with a new triaxially stabilized twin-mount; two other twin mounts were added on the rear superstructure. Fire control directors for the anti-aircraft guns were also installed. After emerging from this refit, Königsberg was employed as a gunnery training ship. During the Spanish Civil War in the late 1930s, the ship participated in non-intervention patrols, during which she forced Republicans to surrender a German freighter they had seized. After returning to Germany, Königsberg resumed her gunnery training duties, and also served as a testbed for radar prototypes. She was scheduled to be transferred to the U-boat School, where she would be used as a target ship for U-boat crews. This duty was interrupted by the outbreak of World War II in September 1939. One day before the German invasion of Poland, on 31 August, Königsberg spotted the Polish destroyers Burza and Błyskawica in the Baltic. At the start of hostilities, she and several other German cruisers laid a defensive minefield in the North Sea. She then went into the Baltic Sea for training maneuvers. Kurt-Caesar Hoffmann served as the ship's captain from June to September 1939. In late 1939, a degaussing coil was installed on the ship's hull. Königsberg returned to active duty in March 1940, when she was assigned to the invasion force for the attack on Norway. The invasion of Norway took place in early April 1940. Königsberg was assigned to Gruppe 3, and was tasked with transporting 600 troops from the Wehrmacht's 69th Infantry Division from Wilhelmshaven to Bergen, Norway. Gruppe 3 also included her sister ship Köln, the artillery training ship Bremse, and the torpedo boats Wolf and Leopard. The Germans left Wilhelmshaven on 8 April, and had reached their target the following day, where Königsberg transferred part of the landing party to several smaller vessels. She then made a high-speed run into the port in an attempt to land the remainder of the infantry in the town directly. A 21 cm (8.3 in) coastal battery at the Kvarven Fort took the ship under fire, and scored three hits, all forward. The hits caused severe flooding and fires in her boiler rooms that cut the ship's power. Adrift, and unable to maneuver, Königsberg had to drop anchor, while she and Köln, Luftwaffe bombers, and the infantry neutralized the Norwegian guns. Königsberg required major repairs before she would be able to return to Germany, so she was temporarily moored in the harbor with her broadside facing the harbor entrance. This would allow her to bring all of her main battery guns to bear against any British naval attack. The rest of Gruppe 3 returned to Germany. On the evening of 9 April, she was attacked by British bombers, but to no effect. The following morning, the British launched another air raid on the ship. The raid consisted of sixteen Blackburn Skua dive bombers of the British Fleet Air Arm (seven of 800 Naval Air Squadron and nine of 803 Naval Air Squadron), launched from RNAS Hatston, Orkney. Königsberg's thin deck armor rendered her quite vulnerable to dive bomber attack. The Skuas attacked in three groups: the nine of 803 NAS, six of 800 NAS, and one aircraft of 800 NAS which lost contact during the outward flight but found Königsberg independently. The dive bombers attacked at 7:20, catching the ship's crew off guard. Half of the dive bombers had completed their dives before the crew realized they were under attack. Only one large anti-aircraft gun was reported as being manned with shells being fired once every five seconds from the aft of the ship with lighter anti-air weapons firing from the shore and adjacent ships firing even later in the attack. Königsberg was hit by at least five 500-pound (230 kg) bombs, which caused serious damage to the ship. One penetrated her thin deck armor, went through the ship, and exploded in the water, causing significant structural damage. Another hit destroyed the auxiliary boiler room. Two more bombs exploded in the water next to the ship; the concussion from the blasts tore large holes in the hull. She took on a heavy list almost immediately, and the captain ordered the crew to abandon the ship. It took slightly less than three hours from the start of the attack for the ship to completely capsize and sink, which gave the crew enough time to evacuate many of the dead and wounded. They also had time to remove a significant amount of ammunition and equipment from the stricken cruiser. Only eighteen men were killed in the attack. The wreck was raised on 17 July 1942, and slowly broken up for scrap thereafter. By 1943, the wreck had been completely dismantled in situ. Wikimedia Commons has media related to Königsberg (ship, 1927). ^ These statistics are for the ship as completed; over the course of her career, armament, crew size, and other characteristics of the ship changed. Smith, Peter C (1982). Dive Bomber!. Mechanicsburg, PA: Stackpole Books. ISBN 978-0-8117-3454-7. This page was last edited on 21 March 2019, at 20:58 (UTC).